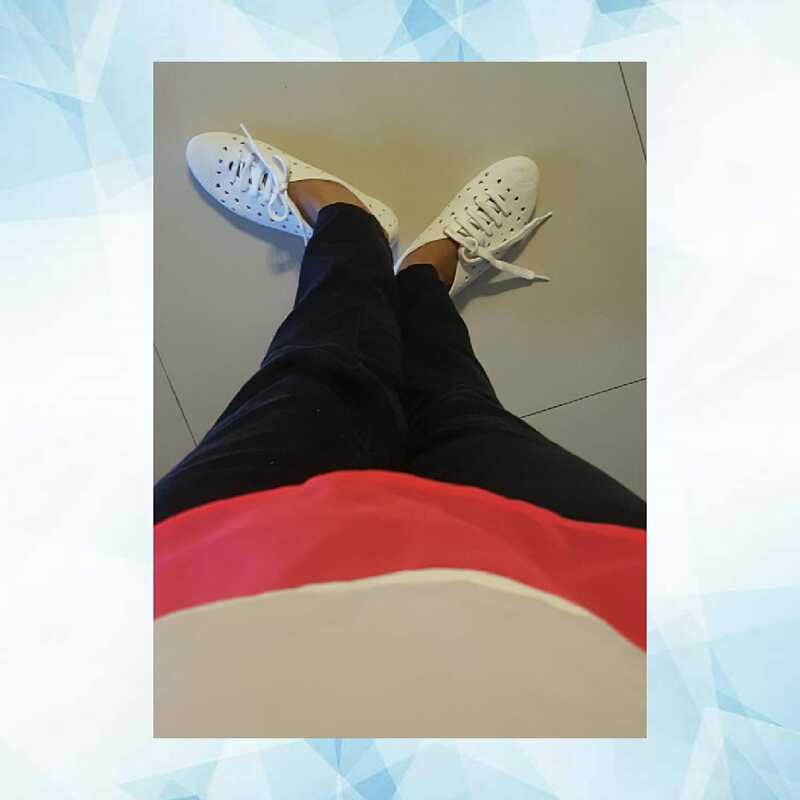 Right now i am a lazy mom who steers through the day in her pyjamas and tees. Also, postpartum our bodies transition quite drastically and our lives are in a state where there is already too much to do and too little time to think about "WHAT TO WEAR"; considering these things, I have worked out a checklist that my new clothing should fit into. Clothes that are nursing friendly. Clothes that do not need ironing or any other special care. Clothes that are baby-wearing friendly. 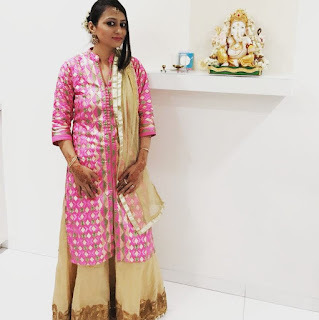 Clothes that can be worn many times with different accessories to change the look, be it for regular wear or party or festivals ( aspiring minimalist you see). Basically I am trying to design a capsule wardrobe that needs minimal clothes but which gives me sufficient options of pairing them differently and conjuring up a whole new look, without having to shop for special nursing or post-partum wear. So, I thought of doing a post on my newly developed love for capsule wardrobes and creativity that surrounds it. * A few buttoned down or zipper Tops- You know what I mean; buttoned down tops are a blessing for nursing moms. This could include your plain/floral print flowy tops or an all time hit Chambray shirt. * A few neutral colored Tees- nothing can beat the comfort of a t-shirt; loose on body, tees that can be paired with scarves or jackets and you could try 2 t-shirt method to have a great quick dressing option for nursing times. 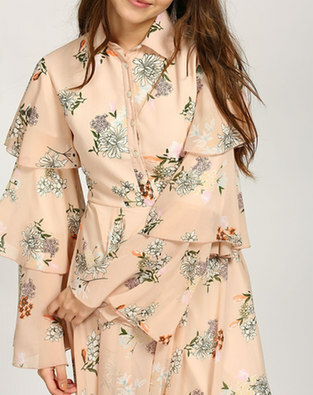 * Buttoned down kurtis, tunics or long maxi dresses- 2-3 kurties/or tunics that you can wear as a dress or with pyjamas/chudidars/pants or leggings with or without dupatta; each time these can be worn differently. * Angrakha style kurtas or dresses for that ethnic Indian look- Angrakhas make the best nursing dresses. You could wear a one piece Angrakha dress or wear the same thing as complete Indian set with angrakha pyjama and dupatta. 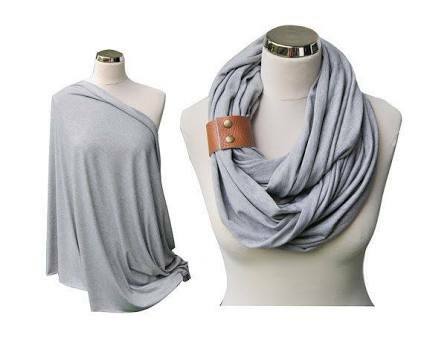 * A poncho like nursing wrap or a few scarves can help you while nursing in public and of course will change the look of your outfit. * Jackets, long shrugs and cardigans help change the look of your dress. A denim jacket is a must have, apart from that you could keep a grey and a black long shrug. * 2-3 long flared skirts- With a toddler I prefer skirts longer than knee length as i can never tell the stunts that I may have to perform to please or control this little ball of energy, so for me my comfort comes before style. 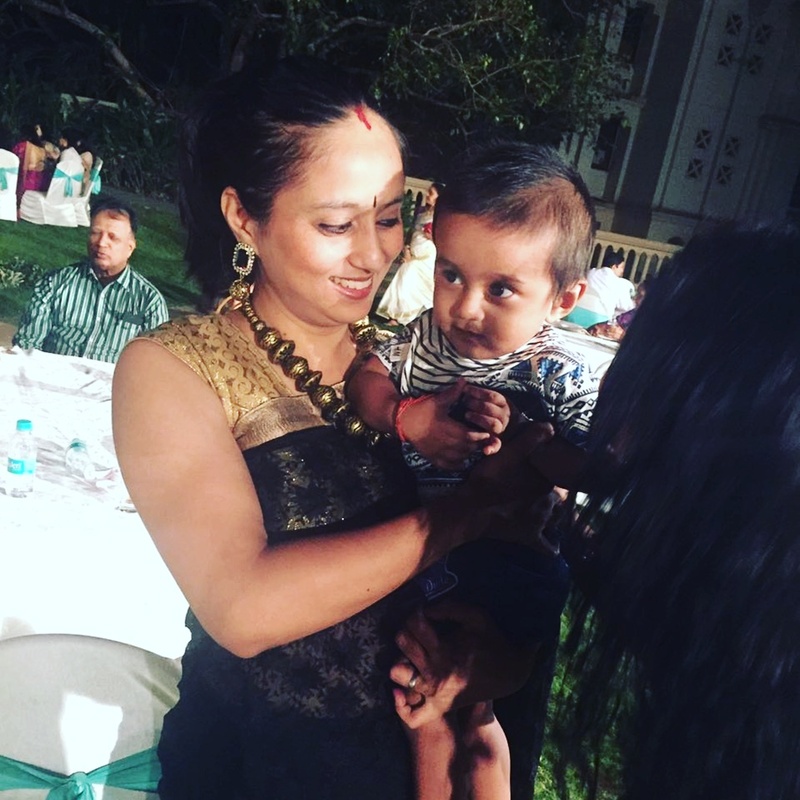 I love those ethnic Rajasthani long skirts and the fact that they can never go out of fashion; however, you may consider wearing them only occasionally or for a short-while, you dont want to topple while running behind your kid right?? Off late I have started wearing these skirts with my old short heavy kurtis(that are now out of fashion) wearing them with skirts gets a whole new sharara type look, perfect for functions. *Jeans - There is no other thing like a comfortable pair of jeans. A black or dark blue jeans and a stonewashed light blue jeans are a must have for any wardrobe. * leggings- I can't imagine my life without these and I have them in every possible color. I desperately need to part away with many as i haven't worn them in ages; but black, white, red and brown leggings definitely can be worn over and over again. 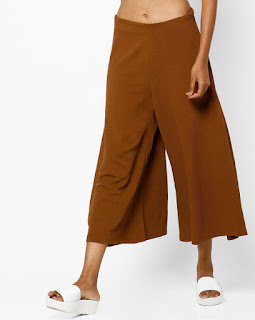 * Palazzos and cropped Cullotes- These are in fashion and need I say that they are super comfy for anybody doing a marathon whole day long. 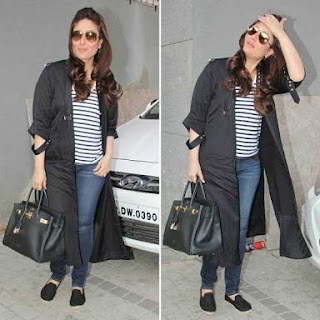 * Shorts - I personally do not wear shorts, but yes, if you are a shorts wearing mumma then you have one more comfort clothing to add on to your mom wardrobe. I like shorts in bright bold colors like Orange, green etc. * Footwear- A pair of sneakers or two, sports shoes, sandals and bellies- choose them wisely because you are going to be on your toes. Avoid high heels or strappy or delicate footwear, if you aren't comfortable in them. 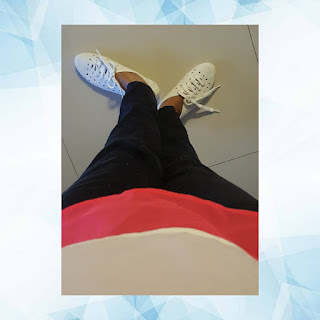 My current favorite are these white sneakers. keep a few comfortable pair of footwears in black, white and beige color. If you have time and energy you could go for custom made dresses, try a few dresses with jackets and overlays that will make your outfit fashionable and these jackets could also be worn with different dresses. Choose contrasting colors in your wardrobe, and avoid similar colors in a category, for example if you have Yellow Palazzos, do not buy same color Cullotes or leggings. Try getting dresses stitched with pocket/s to keep your kerchief and mobile phone handy. You could look at buying loose flowy tops and dresses over tight fitting clothes to hide the tummy, however there isn't anything wrong in flaunting your tummy that carried the love/s of your life. Also avoid the mistake of wearing all things loose, you do not want to look like a sack or jholaa( Rustic Indian bag). A fitted top over Palazzos or a flowy top over your leggings or jeans will make a perfect outfit. Being a new mom takes a toll on your body and lifestyle, and who else on earth needs more pampering than a mom. Get your pre- pregnancy body and glow with VLCC, our sponsor for New Year Fashion-a-thon. VLCC: Your one stop destination for beauty, makeup and health. All their 4,000 professionals are working hard to make your life more beautiful. Join VLCC reward club to get best offers and discounts. Follow the brand on Facebook, Twitter and Instagram to get regular updates. Our fashion train has more to offer, let me take you to my fellow fashionista Jyoti! Jyoti, a banker by profession and a blogger by passion loves to explore new horizons. She loves to experiment and flaunt her makeup, skincare and fashion tips. She is an avid traveller too and you too can join her by hopping into this #NYFASHIONTRAIN as our next stop is Jyoti's interesting Blog. Totally new concept and so useful for a Running Mum with very less help. Too good. Capsule wardrobe, it has got a nice ring to it. I can connect to you post so well, though not a nursing mom but an innate lazy when it comes to styling. I stick to my basics and keep experimenting differently. Like the outfit ideas mentioned here. When it comes to mommies they really give up on putting efforts to style themselves because they are always so loaded with responsibilites . But just even small bits can do their magic. Your post explained this very well. Awesome job you have done here. I likes the way you transformed your skirt into Sharara. I love palajjo and skirts. And I won't mind having few comfortable Capris in my capsule wardrobe. This is Manisha. Capsule wardrobe quite like your detailed ideas for it. It has something for everyone. Those are some interesting ideas I must say. I like what you did with your skirt. I'm so gonna try this. Loved all the ideas .Button down stuff and ponchos were my life saver.Much needed post. Capsule wardrobe has a nice ring to it. I did pick my own required set of post pregnancy clothes which were so useful and comfortable. Today I learnt about capsule wardrobe. what a lovely concept. So cool!! All the ideas are fantastic and very practical. Loved them! Such wonderful ideas to put together a minimal wardrobe that still looks amazing! You model those clothes to perfection. Kudos!